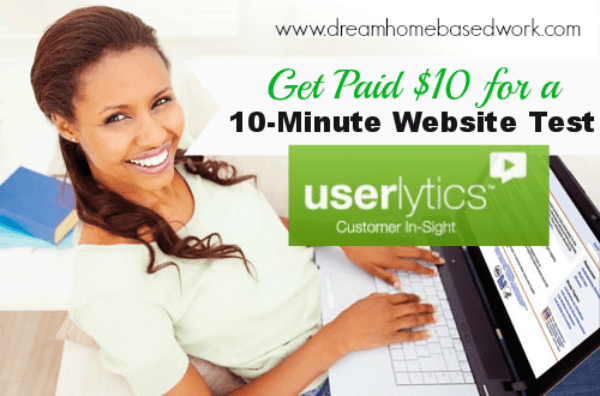 Userlytics is one simple way to earn $10 for reviewing a website within 20 minutes. Website testing, also known as remote usability testing, involves carefully reviewing a client company's website or mobile app and providing your honest feedback. It’s always great to have a fresh perspective from a new visitor. That's why Userlytics can help create a better experience for visitors which means building a better business for site owners. Userlytics.com is a site that recruits testers to review websites from some of the world's largest companies. This website testing company is very similar to other sites such as Whatusersdo, Youeye, and UserTesting. Can anyone sign up for Userlytics? Userlytics is open to everyone worldwide. You must have a Paypal since that is the only payment option offered at this time. As a tester, you will review websites on either your PC or mobile device. While completing the review, you will use Userlytics software to record your voice and computer screen. For each website that you have to review, you will be given a different set of directions on what to do. How Do I know When There Is A Test Available? Like all website testing sites, there is only a limited amount of work available each week on Userlytics. When a website test becomes available, you will be notified by email or whenever you come online. If you do get an email alerting you, you must act quickly in order to get it. They are a first come first serve. How much can I make? When do I get paid? You are paid $10 for every website you test. However, occasionally some tests offer more. Payments are made through Paypal once the client has reviewed your test and “approved” it. What are some helpful tips and advice? Never stop talking, when you are performing a test for a website, it is really important to never shut up. The owners who are paying to get their site reviewed want to hear as much feedback as possible about their site. The clients will not be happy if you don't share enough information and may request a refund. If you happen to test a site you have already visited before, you should make it appear like you have never seen it before. Speak about everything that is there, just like a new user would do. How Do I Get Started with Userlytics? 1. To sign up with Userlytics as a website tester, head over to the userlytics.com website, and click the “Tester” button located in the top right corner. 2. Enter your name, email address, and click submit. You will receive an email, where you must click the confirmation link. When you have done so, you will be directed back to the Userlytics site where you will enter in the password you want to use. You will then be able to view available tests, completed jobs and more on the Tester Dashboard. If you liked this post, then please subscribe to my YouTube Channel for more Work at Home Job Leads. You can also find me on Facebook and Twitter.